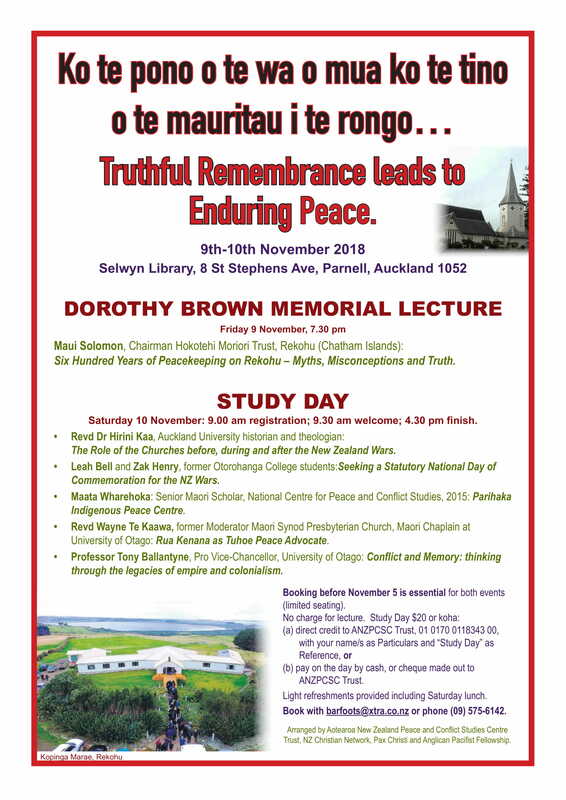 Dorothy Brown Memorial Lecture on Moriori peacemaking, Auckland, Friday 9 November, 7.30pm. Selwyn Library, 8 St Stephens Ave, Parnell, Auckland. Peace Study Day, Auckland, Saturday 10 November, 9.30pm to 4pm. Rev. Hirini Kaa on the role of churches before, during and after the NZ wars. Leah Bell and Zak Henry on why we should have a national day commemorating the NZ wars. Maata Wharehoka representing the Parihaka Indigenous Peace Centre. Book through barfoots or 09 575-6142. Arranged by Aotearoa/NZ Peace and Conflict Studies Centre Trust, NZ Christian Network, Pax Christi and Anglican Pacifist Fellowship.